Pennsylvania is home to dozens of Amish shed dealers. As one of the leading Amish population states, many Amish businesses can be found here producing a wide variety of outdoor structures and storage buildings, including vinyl and wooden sheds. Beyond Lancaster County, Amish-built sheds can be found within easy reach of major Keystone State cities, including Philadelphia, Pittsburgh, Harrisburg, Allentown, Reading, Erie, Scranton and others. Check the guide below to find an Amish-made shed seller near your location. Fox’s Country Sheds & Structures features an extensive selection of Amish-built sheds for the backyard. Wood or vinyl sided options available as well as roof line design, floor options and trim colors. Horizon Structures is an Amish-owned business, and carries a wide ranging choice of Amish-built sheds, available in several different styles such as Saltbox, Victorian, mini-barn, Cape Cod or Cottage. A broad selection of sizes are available among other different options. This store is owned and operated by an Amish-Mennonite family selling Amish-made sheds and storage buildings. They provide a vast choice of Amish-crafted sheds and prefab-garages made from materials including wood and vinyl. Shed types include mini-barn, workshop, Saltbox, or maxi-barn styles. Available in dozens of sizes, colors, floor and roof options. Custom-made sheds available as well. “A”-framed, Quaker, Victorian, mini-barn, Dutch barn, Provincial, Utility, New England, Victorian Cottages or Cape sheds available in a multitude of options including painted duratemp or maintenance-free vinyl siding. Each piece is custom-built to customer preference by Lancaster County Amish woodworkers. Lancaster County Barns carries an extensive selection of storage sheds, horse barns, garages, garden sheds, gazebos and more, available in many different styles. Roofline and siding options such as duratemp plywood, Georgia Pacific dutchlap vinyl, white pine boards cedar, shiplap siding or metal siding available. All items are hand-made by Amish craftsmen. ABC Woodcraft carries different Amish-made items including sheds, gazebos, swing sets, playhouses, wishing wells and more. Custom storage buildings, including sheds, garages, and barns crafted using time-honored Amish construction techniques. We deliver or build on site. We also sell gazebos, pergolas, chicken coops, dog kennels, swing sets, and other outdoor structures. Dura-temp and vinyl storage sheds available in a variety of options. This store provides Amish-made storage sheds made from high quality materials by skilled woodworkers. Lancaster County’s Stoltzfus Builders specializes in pole barns, sheds and garages. Provides heavy-duty storage shed ramps. Glick Woodworks carries vinyl and wooden storage sheds, available in a variety of options in different styles. This store provides custom-made small storage sheds and trash can sheds in Lancaster County. Centre Valley Woodworks carries storage sheds with vinyl siding. Hampton Hall Structures features a variety of outdoor products, including sheds. Solanco Structures carries run-in sheds and shed row horse barns among other custom-built items in southern Lancaster County. Broad choice of sheds and other outdoor buildings. Brick Lane Structures features an extensive selection of custom-made sheds, available in dozens of options and different styles including board and batten sheds, Quaker, Victorian, Classic, Dutch or mini-barn sheds. Vinyl or duratemp siding options available as well. Kauffman Woodworks specializes in vinyl and wood sheds, garages, pool houses and horse barns. Garden sheds, A-framed sheds, available in vinyl or wood. River View Horse Barns features a nice choice of run-in sheds, storage sheds or shed rows. Each product can be built to order and to the customer’s specifications. Lancaster’s Harvest Structures features Amish-made outdoor buildings including vinyl or cedar storage sheds, garages and more. Custom vinyl storage sheds available with a number of options including floor, window or siding colors. Each product can be made-to-order. Furnace Road Structures specializes in vinyl solid storage sheds, available in England Cape or Chalet style. Lancaster County Amish-made sheds, gazebos, garages, horse barns and more. J & M Woodworks carries a broad choice of wood, vinyl and cedar sheds and other custom storage buildings that can be customized to any specifications. This store provides a wide selection of sheds in several different styles. Amish-built sheds available in a variety of styles. Sheds, gazebos, chicken coops and cupolas for sale. J & S Barns specializes in board and batten sheds. Pop’s Barns provides an extensive selection of Amish-built sheds, available in several different styles such as Quaker, Dutch, Victorian or A-frame. Can be built to order to fit any specifications. Myerstown Sheds & Fancing carries a range of sheds, gazebos, fences, arbors and lawn furniture. This store has 3 different locations. Yoder Barns & Storage provides Amish-built utility and garden sheds, available in several different styles and a broad choice of options. Lancaster County Amish-made wooden and vinyl sheds available in custom designs. Rainbow Structures offers quality sheds and garages at a reasonable price. Amish-made storage sheds, available in common styles. White Pine Structures carries a nice choice of Amish-made backyard buildings including sheds or gazebos, available in several different styles. Quality sheds crafted by skilled woodworkers. This store carries numerous sheds, available in different styles with a full line of options. Lapp Structures provides a broad range of products crafted by Amish and non-Amish woodworkers from Lancaster County. Sheds catalog covers several different styles such as garden, A-frame, hip-roof, Victorian, Quaker or Dutch Colonial. Shed options include structural, door, vent or interior options. Rocky Mountain Structures specializes in high quality Amish-made outdoor items, including sheds available in Dutch barn, mini-barn, Victorian, Quaker or A-frame styles. Storage structures made from vinyl and wood materials. Amish sheds can be built-to-order, to create a one-of-a-kind design. Storage sheds among a variety of outdoor structures available. Storage sheds, hunting cabins or playhouses available. A & J Toy Cabins specializes in log structures such as trash can sheds, garden sheds or playhouses, available in common styles. Amish-built sheds and garages available in common styles. Customizable. Sheds, barns and outdoor play available. This store provides a variety of products made by skilled Amish craftsmen including pine Quaker storage sheds, chicken coops and dog boxes. AK Woodworks offers a broad choice of sheds made from fine wood or vinyl. Full line of shed options available. Amish Marketplace has been in business for over 12 years, featuring sheds and other backyard structures such as garages, gazebos, playhouses or chicken coops. Amish-made products come in a broad choice of styles. Each piece made from high-quality materials for durability. This store has three different locations, in Reading, Malvern, and Nazareth. Green Acres Outdoor Living specializes in outdoor Amish-built products including painted or vinyl sheds in Classic, Provincial, mini-barn, Dutch or Cape styles. Custom shed options cover windows, door shape, and paint color. Offering a broad choice of shed sizes to fit diverse needs. E.K.’s Structures offers a full line of backyard structures. Whether you choose one of our pre-designed models or a custom designed structure, you have chosen the highest quality shed, garage, or other storage structure in the area. Our backyard structures are used for everyday storage, offices, garages, workshops, potting sheds, studios, lodges, playhouses, chicken houses, and much more. We also produce garages in single and double models, and we will custom build on-site. Many colors and styles to choose from and we will also color match your new building to your home or other existing structures upon request. All of our building come with a 30 year warranty against manufacturer defects, delivery is free, and we also offer 0% down, rent-to-own, no credit check financing. We will build to please you, our valued customer. Backyard buildings including sheds available in a broad selection of styles. Option choices cover roof, floor, and windows. All American Storage Buildings provides a wide ranging choice of Amish-built sheds, garages, gazebos, shelters. Custom options include duratemp siding and trim paint colors, standard vinyl siding colors, vinyl trim colors, metal roof colors or shingle types. Yoder’s Backyard Structures provides a broad selection of Amish-made sheds, gazebos, garages and barns. Mini sheds, workshop sheds, hi-side sheds, Chateau and Quaker styles are available with several different options for the roof, windows, floor, siding and colors. Made by skilled Amish and Mennonite craftsmen. Pine Creek Structures is one of the biggest Amish outdoor building retailers. They provide products in ten states. In Pennsylvania alone they can be found at over 20 different locations. A vast array of sheds are available in various styles including mini-barn, Quaker, Victorian, Cape Cod or Dutch. Each structure Amish-crafted with various warranties offered; custom-made sheds can be had as well. Note for residents of Pennsylvania: Please confirm hours of Amish shed companies listed here. Locations and hours sometimes change. When a business is Amish-owned as a rule it will not operate on Sundays, due to Amish religious beliefs. However certain non-Amish dealers selling Amish products may be open. We seek to keep the above information current; not responsible for changes. With a thriving business presence in many of its Amish communities, Pennsylvania is an ideal place to look for an Amish-made shed or other storage building. Many small Amish family shops build outdoor buildings such as sheds, gazebos, and barns. Pennsylvanians don’t have to travel far to visit an Amish shed manufacturer at the source, with many operating in Lancaster County and other Amish communities (Pennsylvania has over 50 Amish settlements; read more on the Amish in PA). An Amish shed can make an excellent addition to a backyard or any other place you need storage in an attractive building. Some Amish-made sheds are quite decorative, coming in styles such as Victorian, Cape Cod, Dutch, Quaker, and others. With a wide range of customization options, you can order a shed to fit your specific home and outdoor setting. Amish shed craftsmen, like other Amish businesspeople, such as furniture makers, believe in a job well done. 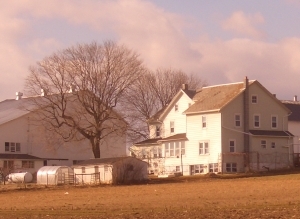 Amish companies focus on quality work done in a low-key environment, with shops typically found right at the Amish home. This small-scale, grassroots aesthetic contrasts sharply with big box production, lending an appeal to Amish-made goods that has proven a winner in the marketplace (read more on Amish furniture in PA). Where can I buy an Amish shed in Pennsylvania? PA Amish shed buyers have multiple options. The numerous Amish shed outlets listed in the guide above offer the convenience of close proximity to large population areas, along with good selection, allowing the prospective shed buyer to check what’s available without having to travel too far. Some shed shoppers do prefer to seek the “Amish direct” solution, and may travel to an Amish community to purchase straight from the Amish maker (not all Amish sell in this manner, with quite a few producing their storage buildings strictly on a wholesale basis). Finally, the online Amish shed buying option is a route chosen by many. Online sellers provide extensive catalogs with the necessary details on sheds and the ability to customize a purchase. Many will even deliver and place a shed at your home. I am looking to add my shed business to your directory. How would I go about having it listed under Amish Sheds-Pennsylvania? Sure Emanuel, you can send your info (business name, address, contact, description of work you do and any other relevant info) to me at ewesner@gmail.com and I’ll be happy to list it. I am looking to purchase a double glider with a canopy for my backyard. Do you know of anyone in the Memphis tn area. Can you please direct me to a store in or near Philadelphia that sells Amish wood sheds? Please let me know if you have any further questions and I’d love to know it when you update this. Hi Chris, thanks. Just updated it above.